A newspaper that has been published for more than 200 years has been saved, weeks after it announced it was closing. The Sunday Independent, which provides in-depth coverage of sport in the south west, will be back on sale from the weekend. A businessman in Cornwall has stepped in to take over the title. Seventeen jobs have been saved at the paper's headquarters in Liskeard. It has been bought by Peter Masters, who also co-owns Truro City Football Club. 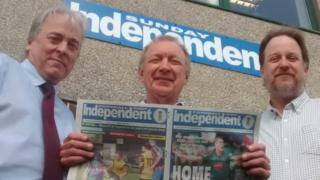 He said: "Like so many of our family of readers, I've read the Indy every Sunday all my life. The paper's new managing director, writer and photojournalist Colin Bradbury said: "Our first and most important task will be to get the Indy that people love, complete with our existing team of writers and contributors, back in the shops this Sunday, April 23." The price of the paper has been increased by 20p to £1.20. Editor John Collings, who has worked for the paper since 1988, said: "We have been simply overwhelmed by the messages of love and affection for the paper and we thank everybody for their support.